Cherry Tree Village in Middletown, condos for sale. Call 732-598-7700 to see the townhouses For Sale. 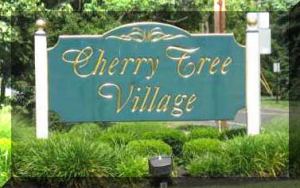 Cherry Tree Village Middletown is a townhouse community, in Middletown, NJ. These townhouses are either two or three bedroom homes. They come with either 1.5 or 2.5 baths. The homes are on three levels with a basement. A fireplace was an option to the original owner. Cherry Tree Village is located near the intersection of Route 35 and Palmer Ave in the New Monmouth section of Middletown, and there are 241 homes. The homes were built around 1980. Your pets are welcome in Cherry Tree Village Middletown. In addition, there is a clubhouse with a playground, a basketball court and tennis courts. Commuters will love living here because of the location. This is because the New Jersey Transit North Jersey Coast Line has a station in Middletown. Bus service is also available, the Sea Streak Ferry is a short drive away. In addition, there are two exits in Middletown for the Garden State Parkway. Students who live in Cherry Tree Village Middletown will attend Harmony Elementary School, and they will then go on to Thorne Middle School. When students enter high school they will attend Middletown North High School. Middletown provides education to over 10,000 students in the seventeen schools. In addition, there are also private schools in Middletwown, and more are in nearby towns. Call 732-598-7700 to see the townhouses For Sale in Cherry Tree Village Middletown. Middletown has the highest population in Monmouth County. You’ll find shopping and dining along Route 35. Furthermore, live entertainment is in Red Bank at the Count Basie Theater and the Twin Rivers Theater. Concerts at the PNC Bank Center offer major venue musical entertainment. Sandy Hook is nearby, with numerous beaches. The numerous marinas in the area allow boating enthusiasts to find places to dock their boats. Middletown also has an extensive park system.